Challenging the forces that are taking creativity and inspiration out of the classrooms. NYC Parents – Refuse the MOSL Assessments! Did you know that test refusal is not limited to the NYS Common Core ELA (English-language Arts) and math assessments that are administered to students in grades 3-8? My daughter will be entering first grade this year and I refuse to allow her to take the NYC local assessments, which are used solely for teacher evaluation purposes. In NYC, these tests – administered to students in K-12 – are referred to as MOSLs (Measures of Student Learning). You can read more about them here and here. Ask your child’s teacher for more information about the MOSLs, specifically which assessment is being used at his/her school (there are various NYCDOE-approved assessments). Below is a copy of my refusal letter in case you wish to use it. I borrowed some of the language from NYS Allies for Public Education’s (NYSAPE) 2015-2016 Refusal Letter, which you can access here. Please also visit Change the Stake’s website for sample opt-out letters that are specific to NYC public schools. I am writing to inform you that I refuse to allow my daughter, _______________, to participate in any local/benchmark assessment used in the New York State teacher evaluation system administered in the fall, winter, and spring of the 2015-2016 school year. Specific to New York City is the MOSL testing program, which includes the NYC Performance Tasks for math and ELA (English-language Arts). My refusal should in no way reflect on the hard work and talents of the teachers and staff at P.S. ______. As both a parent and an educator, I see these tests as harmful, expensive, and a waste of time and valuable resources. The Grade 1 NYC Performance Tasks, in particular, are poorly constructed and developmentally inappropriate. I object to the fact that my daughter’s teachers had no input in creating the tests and rubrics. Assessments should be teacher-created, not written by a testing company or central education department office. I also refuse to allow any data to be used for purposes other than the individual teacher’s own formative or cumulative assessment. I am opposed to assessments whose data is used to determine school ranking and teacher effectiveness, or is used for any other purpose other than for the individual classroom teacher’s own use to inform his or her instruction. My family and I are very fond of the P.S. ______community. I appreciate the school’s commitment to educating the whole child, particularly through the arts, and feel that the city and state’s insidious testing programs take away from this. Please let me know if you have any questions or concerns. I understand the demands of your job and am grateful for your dedication to the students of P.S. ______. I teach elementary school in the East New York section of Brooklyn, New York. In 2013 and 2014, I administered Pearson’s New York State Common Core tests to English-language learners (ELLs). There is nothing meaningful about these assessments; no teacher I know supports them and I will not allow my child to take the tests when she enters third grade (even if the high-stakes are removed). Here are ten reasons why Pearson’s NYS Common Core tests should never see the light of day. Additionally, the below graph – created by Lace to the Top – shows that the third grade Common Core tests are twice as time-consuming as the SAT. 2.) They are developmentally inappropriate. Lace to the Top recently analyzed third grade Common Core test samples and determined that Pearson’s NYS Common Core test questions are 2-3 grade levels above the grade being tested. The reading passage used for third grade was shown to have a readability average of 7.3 (7th grade)! 3.) Pearson’s NYS Common Core standardized tests, which are costing the state $32 million, are not teacher-created, nor do they accurately reflect the contextualized skills and knowledge that students gain in the classroom. The tests are poorly constructed and uninspiring, and they contain ambiguous questions. 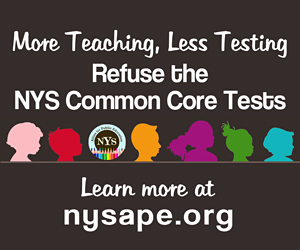 557 New York State principals signed this letter denouncing the tests. 4.) With Pearson’s Common Core state tests at the center of K-8 education in New York State, curriculum has narrowed, particularly in schools in low-income areas whose test scores tend to be low. Fearing increased scrutiny and potential closure, raising test scores has become the main focus in many schools. Some schools are little more than test prep factories with diminishing enrichment and project-based learning opportunities. Beginning in kindergarten, students are being taught test-taking strategies, most notably through the context-lacking close reading technique used in Common Core-aligned English-language arts. Pearson’s developmentally inappropriate and poorly constructed scripted reading program – ReadyGEN – is test prep for the NYS Common Core ELA test. Sept/Oct 2014 Common Core-aligned NYC Baseline Performance Tasks in ELA and Math (MOSLs used for teacher evaluation purposes only). Running Records administered one-on-one 4-5 times per year (they test reading levels). 12 Common Core-aligned end-of-unit GO Math! assessments (each comprised of 24 multiple choice questions and a multi-step extended response question). Monthly Common Core-aligned ReadyGEN writing assessments testing students’ understanding of narrative, persuasive and informative writing. Mid-year benchmark assessment in ELA – End of unit 2 ReadyGEN test comprised of 5 multiple choice comprehension questions, 5 multiple choice vocabulary questions and 1 written response. Mid-year benchmark assessment in Math – GO Math! test comprised on 40 multiple choice questions; 15 questions on skills not yet learned. May/June 2015 Common Core-aligned NYC Performance Tasks in ELA and Math (MOSLs used for teacher evaluation purposes only). 6.) The New York State Education Department (NYSED) lacks transparency and ethics. In upholding the corporate education reform agenda, which seeks to privatize public education, the NYSED’s intention is to perpetuate the false narrative that our schools are failing. Fred Smith, a NYS testing expert and statistician, and Lace to the Top have reported at length about Pearson’s poor quality tests and the NYSED’s unreliable test data, specifically its delayed release of technical reports, which evaluate the Common Core tests, missing test questions and predetermined test scores. The NYSED manipulates cut scores in order to legitimize its above-mentioned agenda; not only are cut scores constantly changing but the NYSED sets them AFTER the tests have been scored. Thus, the NYSED’s claim that 70% of our students are failing is invalid. 8.) English-language learners (ELLs) must take Pearson’s NYS Common Core ELA test after just one year in the system. Students with IEPs are also required to take the tests unless they qualify for the New York State Alternate Assessment (NYSAA), which too is flawed. For a variety of reasons, it is misleading, insulting and grossly irresponsible of the NYSED to claim that 97% of ELLs and 95% of students with IEPs in grades 3-8 are “failures” in ELA. These figures completely disregard the growth students make in our classrooms. 9.) Our students are suffering. I’ve heard countless stories of kids who are sickened – both physically and emotionally – from New York State’s toxic Common Core testing program. I’ve personally witnessed students’ tears, anger and despair, and it’s heartbreaking. There is nothing humane, nothing redeeming about these tests. 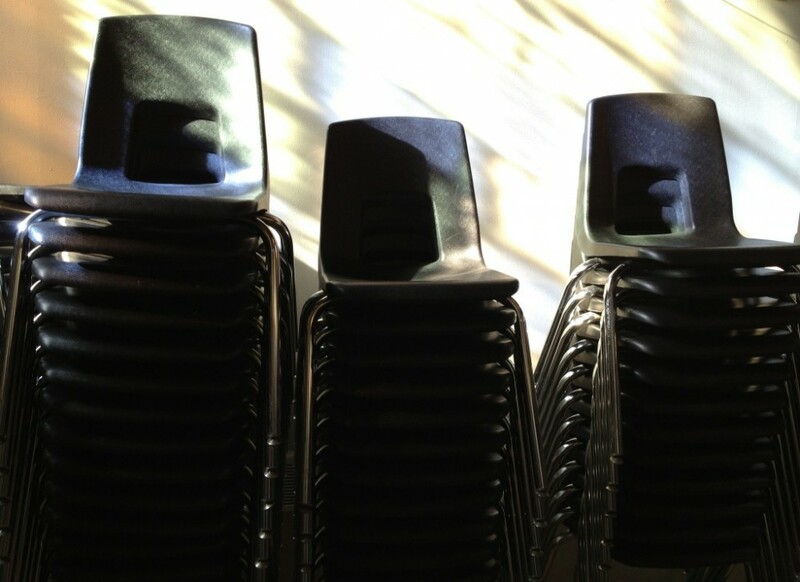 Morale is plummeting as teachers and administrators feel complicit in the state’s abuse of our children. 10.) Governor Andrew Cuomo has proposed basing 50% of a teacher’s evaluation on test scores from these highly flawed Common Core state assessments. Not only are these test scores unreliable but the American Statistical Association has warned against using the value-added model (VAM) to rate teachers and schools. As you can see, the negative impact of NYSED’s punitive Common Core testing program is far-reaching. But we – as parents and educators working together – can take back power by refusing these tests. In order to save public education, a cornerstone of democracy in the United States, we must start thinking communally rather than individually. It is not helpful to speculate about which students should or should not opt out in order to protect teachers’ evaluations. The bottom line is that the current teacher evaluation system is flawed. Opting out in large numbers is the most powerful way for parents to let policymakers know that we do not want our children, teachers and schools evaluated based on standardized test scores. Our students and teachers are not failures; rather the NYSED has failed us. NYC-based Change the Stakes has updated their FAQ! a New Year full of love, peace and happiness. Love, peace and happiness. I sometimes feel these emotions at school, but they are fleeting and occur only behind “closed doors,” in the presence of 25 six and seven-years-olds. I’m certainly not feeling any love or “sincere gratitude” from the NYCDOE administration, including the district in which I teach. But thank you, Bill, for the gesture. If ever you want to consult with working teachers and administrators who will tell you what our schools REALLY need in order to thrive, please reach out. Unfortunately, our prescription for education reform does not go along with the state and federal governments’ agendas, which, as it’s becoming increasingly evident, center on using teachers as scapegoats for the educational ills in our country. I begin this new year with mixed emotions. I’m excited to resume the creative, inspiring work I do with my energetic first graders – we are a family – but I’m also weighed down with new feelings of self-doubt, indignation and increasing despair. Recent observations of my teaching practice, which are not holistic, have felt punitive. Charlotte Danielson’s Framework for Teaching – a rubric that addresses the so-called instructional shifts of the Common Core – is used as a checklist for these brief and infrequent snapshots of the work being done in my classroom. During this time, if administrators do not see evidence of what they are looking for – such as an assessment tied to an art project they are observing me teach – then I am at risk for a developing or ineffective rating for that component of the domain. Additionally, New York’s use of valued-added modeling (VAM) to rate teachers, a tool widely considered to be junk science, is further demoralizing. Last year, I was rated “developing” on the local and state measures of New York’s fledgling teacher evaluation system; I still don’t know what standardized tests these ratings were based on since my English-language learners (ELLs) made progress on the 2014 NYS English as a Second Language Achievement Test (NYSESLAT). 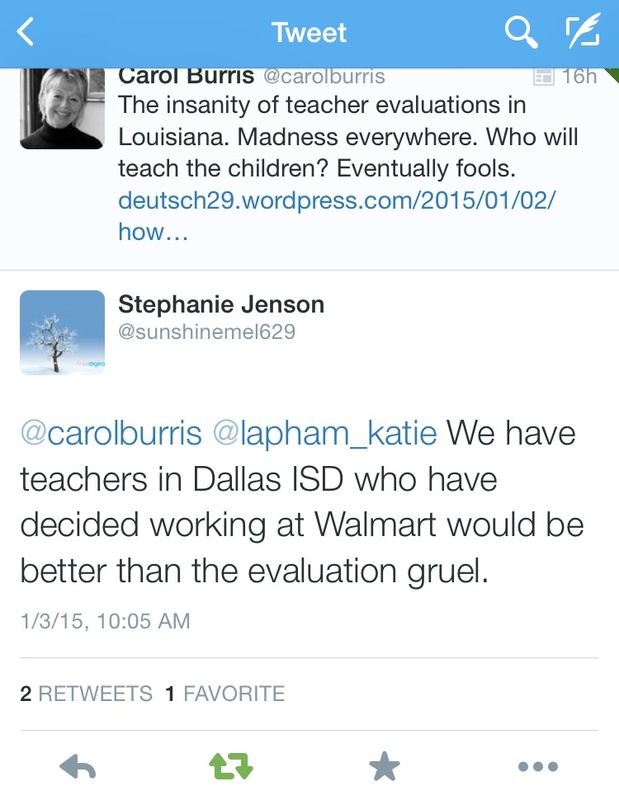 These Tweets from January 3, 2015 show that draconian teacher evaluation plans are not unique to New York. They make me want to cry. On the first day of 2015, Carol Burris, principal of Long Island’s South Side High School, reported in The Washington Post’s Answer Sheet on the latest developments of New York’s teacher evaluation system. New York Board of Regents chancellor, Merryl Tisch, now wants 40% of teachers’ APPR (Annual Professional Performance Review) to be based on state test scores (it’s currently 20%). To Tisch’s dismay, APPR which she helped design, has not produced the results that she and Cuomo wanted; only 1 percent of teachers in New York State were rated ineffective in the most recent evaluation. The plan, according to the state’s Race to the Top application, was for 10 percent of all teachers to be found ineffective, with small numbers designated as highly effective. The curve of the sorting bell was not achieved. Regardless of what 60%* of your evaluation says, if the growth score (test score) says you are ineffective, your entire rating will be ineffective. If you receive two ineffective ratings you will no longer be allowed to teach. *60% is based on observations (measures of teaching practice). The Smarter Balanced assessments are a key part of implementing the Common Core and preparing all students for success in college and careers. Administered online, these new assessments provide an academic check-up and are designed to give teachers and parents better information to help students succeed. Smarter Balanced assessments will replace existing tests in English and math for grades 3-8 and high school in the 2014-15 school year. Scores from the new assessments represent a realistic baseline that provides a more accurate indicator for teachers, students, and parents as they work to meet the rigorous demands of college and career readiness. I detail these new testing initiatives because, contrary to what Common Core supporters argue, the Common Core State Standards are – by design – inextricably linked to Common Core-aligned assessments. The Common Core standards do not and cannot stand alone. They must exist in conjunction with aligned assessments in order to measure students’ “college and career readiness.” Student scores on these Common Core assessments are then used to hold teachers (and schools) accountable for using the Common Core standards to “prepare students for college and careers.” I have reported at length on the devastating impact these new Common Core tests have had on student learning and student morale in New York City schools. Lohud.com also created the below table to compare key features of the “lost standards” to the Common Core standards. As you can see, the Common Core came as a package, which included a testing program and a new teacher evaluation system. The “lost standards” did not. Unlike the “lost standards,” the Common Core is streamlined, making it easier to hold teachers accountable (via test scores and the Common Core-aligned Danielson Framework for Teaching). Furthermore, the adoption of the Common Core brought $700 million in funding to New York. The “lost standards” did not. We teachers have an even bigger fight on our hands this year. If Andrew Cuomo and Merryl Tisch have their way, 40% of my rating will be based on measures determined by the state. I have no idea what they’ll use to assess first grade teachers, but I can assure you that any new NYS Common Core assessment that’s not teacher-created will be developmentally inappropriate. One of my goals for the new year is to take a closer look at New York’s “lost standards” for ELA and ESL. Like Chris, I wish to make the argument that good work has already been done by educators in creating sound standards for our state. We should continue this work for the other content areas. Of the “lost standards,” Susan Polos, a highly regarded New York educator, was quoted by Gary Stern as saying, “Our standards were carefully and thoughtfully created, with educators involved, and should have survived.” I am not fond of standards (or rubrics), but I recognize the need for them. I would also like to investigate alternative math standards. If I had the time, I’d create an entirely new math curriculum for first grade. GO Math!, which is Common Core-aligned, is a headache-inducing, poorly crafted math program that the NYCDOE adopted for its schools. If (when?) New York state abandons Common Core, we’d also have to propose a new assessment program and teacher evaluation plan. The working educators of New York know what’s best for our students. We need to reclaim public education in 2015.